Dr. Peter Austin, a senior scientist in the Schulich Heart Research Program, and Dr. Kathleen Pritchard, a senior scientist in the Odette Cancer Research Program, were selected as highly cited researchers for 2015 by Thomson Reuters. They each earned this distinction by writing the greatest number of papers officially designated by Essential Science Indicators as “highly cited papers,” ranking among the top 1% most cited for their subject field and year of publication. Dr. Jon Barrett, director of the Women & Babies Research Program, was named the inaugural Waks Family Chair in Maternal-Fetal Medicine Research at Sunnybrook. The endowment will enable Barrett to focus on the clinical care of patients with high-risk pregnancies and births, and support research and education in this arena. The gift was established by a donation by Fred and Linda Waks, matched by family and friends. Read Philanthropic gift establishes Chair in maternal-fetal medicine for the full story. Dr. Mary Bell, an associate scientist in the Holland Bone and Joint Research Program and a rheumatologist at Sunnybrook, was named 2015 Rheumatologist of the Year by the Ontario Rheumatology Association. The award recognizes her outstanding leadership and commitment in arthritis and medical education research. Dr. Junaid Bhatti, a scientist in the Tory Trauma Program, received the Outstanding Poster Award at the 59th annual conference of the Association for the Advancement of Automotive Medicine. His poster, “Crash risk factors in obese drivers in the United States,” was voted outstanding by about 150 conference attendees. His research aims to assess driving performance of obese drivers using simulation technology. Dr. Avery Nathens, director of the Tory Trauma Research Program, and Dr. Donald Redelmeier, director of Evaluative Clinical Sciences, are co-authors. 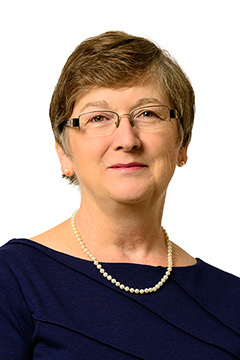 Dr. Sandra Black, director of and senior scientist in the Hurvitz Brain Sciences Research Program at SRI, and a cognitive and stroke neurologist at Sunnybrook, was named an officer of the Order of Canada by His Excellency, the Right Honourable David Johnston, Governor General of Canada, on July 1, 2015. She is also a professor in the department of medicine at the University of Toronto, where she holds the Deborah Ivy Christian Brill Chair in Neurology. Her research focuses on the cognitive complications resulting from stroke and stroke recovery, the differential diagnosis of dementia, the use of neuroimaging to understand brain-behaviour relationships in stroke and dementia, the relationship between Alzheimer’s disease and cerebrovascular disease, and imaging-genetics correlations. Dr. Brandy Callahan, a postdoctoral fellow supervised by Dr. Sandra Black, director of the Hurvitz Brain Sciences Research Program, was awarded an Excellence in Research Fellowship through the 12th annual L’Oréal Canada-UNESCO for Women in Science Awards. Read more about Callahan in Women in science and the search for good mentorship. Dr. Nick Daneman, a scientist in the Tory Trauma Research Program, was named a Phase 2 Clinician Scientist from the Canadian Institutes of Health Research. He will receive $180,000 over three years to conduct a randomized controlled trial that will compare the length of time necessary for effective antibiotic therapy to treat bloodstream infections. Dr. Kullervo Hynynen, director of Physical Sciences, was chosen as the winner of the 2014 Rayleigh award by the Institute of Electrical and Electronics Engineers (IEEE). The Rayleigh award represents the IEEE’s highest honour for achievement within the field of ultrasonics and is presented annually by the Ultrasonics, Ferroelectrics and Frequency Control Society. Dr. Paul Karanicolas, a scientist in the Odette Cancer Research Program, received a New Investigator Award, worth $300,000 over five years from the Canadian Institutes of Health Research (CIHR) for his work on an integrated program to improve outcomes in patients undergoing liver and pancreas surgery in Canada. Dr. Yoo-Joung Ko, an affiliate scientist and medical oncologist in the Odette Cancer Research Program, and his student Rehana Jamani received the inaugural Glenita Mungcal GIST (gastrointestinal stromal tumour) Research Award from GIST Sarcoma Life Raft Group Canada. Together with Dr. Eugene Hsieh, a pathologist at Sunnybrook, they will examine tumour tissue from GIST patients to determine the expression of novel immune targets. Dr. Mario Masellis, an associate scientist in the Hurvitz Brain Sciences Research Program, was recognized with a 2014 Maud Menten New Principal Investigator Prize as a finalist in clinical research from the Canadian Institutes of Health Research Institute of Genetics (CIHR-IG). The prize recognizes the excellence of Canadian new investigators working in health research within the CIHR-IG’s mandate. Aaron Prodeus, a PhD candidate working in the molecular targeting and therapeutics lab led by Dr. Jean Gariépy, was awarded a doctoral fellowship from the Canadian Breast Cancer Foundation. He will use the funds, $70,000 over two years, to design drugs blocking PD-L1 and PD-1 interaction between tumour and immune cells in breast cancer patients. The overarching aim is to develop a novel therapeutic for the treatment of metastatic breast cancer. Dr. Soham Rej, a geriatric psychiatry fellow supervised by Dr. Nathan Herrmann, an associate scientist in the Hurvitz Brain Sciences Research Program, was awarded a fellowship from the Canadian Institutes of Health Research. He will use the funds, $110,000 over two years, to study pharmaco-genetic techniques to learn about which biological mechanisms underlie kidney disease in bipolar disorder. Dr. Paul Sheeran, a postdoctoral fellow in the lab of Dr. Peter Burns in Physical Sciences, received a CIHR Banting Postdoctoral Fellowship. He scored in the top 8% of applications. The award, $140,000 over two years, will help him to develop a new ultrasound-based platform for anticancer drug delivery using acoustically activated nanoscale and microscale agents. Dr. Greg Stanisz, a senior scientist in Physical Sciences, was awarded the 2014 Edmond Odette Prize for innovation and technology in cancer care by Sunnybrook. The prize, worth $5,000, celebrates an individual within the Odette Cancer Program who has significantly contributed to improving cancer care through developments in imaging, therapeutic or other technologies. Stanisz is developing a unique magnetic resonance imaging pulse sequence that can be used to monitor a patient’s response to therapy. Dr. Sean Udow, a clinical fellow supervised by Dr. Mario Masellis, an associate scientist in the Hurvitz Brain Sciences Research Program, was awarded a one-year clinical fellowship worth $50,000 from Parkinson Society Canada. His research will focus on dementia in patients with Parkinson’s disease and Lewy bodies, two neurodegenerative diseases with similar clinical and pathological features. He aims to examine the effect of blood pressure fluctuations on cerebral blood flow and cognition using clinical and neuroimaging parameters. Dr. Eranga Ukwatta, a postdoctoral fellow with Dr. Graham Wright, director of the Schulich Heart Research Program, received a postdoctoral fellowship from the Natural Sciences and Engineering Research Council of Canada to develop image-processing algorithms for cardiovascular imaging. He also won the First Prize Award at the 13th annual Imaging Network Ontario Symposium in London, Ontario. Dr. Martin Yaffe, a senior scientist in the Odette Cancer Research Program, was named a member of the Order of Canada by His Excellency, the Right Honourable David Johnston, Governor General of Canada, on July 1, 2015. Yaffe is a pioneer in the development of methods for contrast-enhanced and digital detection of breast cancer. His research has helped to establish the standards of care that are used to detect breast cancer and informed the creation of associated policies used in North American health care systems. He was the first to show that using contrast-enhanced digital mammography could identify breast tumours that eluded standard film mammography.